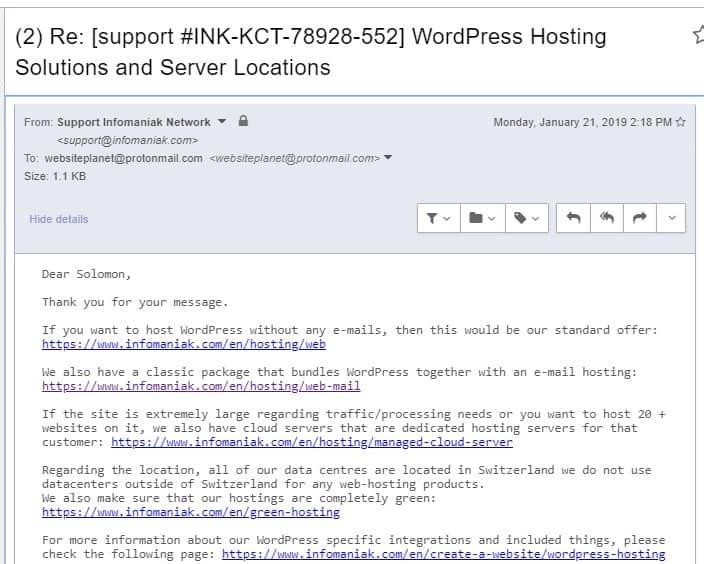 Infomaniak Review 2019: Is Infomaniak a Good Hosting? Infomaniak is a hosting company based in Geneva, Switzerland. Established in 1994, the hosting vendor is a market leader in the Swiss web hosting space. It owns all its data centers and all other elements critical to ensuring that it offers high quality hosting solutions. Infomaniak Network SA, popularly referred to simply as Infomaniak, is a Swiss-owned hosting company founded in 1994 by its two shareholders, Boris Siegenthaler and Fabian Lucchi. The hosting company’s head office is in Geneva, Switzerland. The vendor is the number one hosting company in Switzerland by market share. Infomaniak prides itself on providing high-end hosting services at affordable prices to business enterprises of all sizes in Switzerland as well as several other countries, including France, Chad, Belgium, and Congo. The Infomaniak website is available in English, French, German, Italian, and Spanish. Infomaniak owns TIER 3 data centers located in Switzerland. The vendor markets itself as a green company, making sure that all its data centers are environmentally-friendly. Its network uses an internet connection of over 70 Gbit/s which is powered by renowned internet suppliers in Switzerland, providing high availability and reliability. For clients who are looking for flexible and reliable solutions that allow scaling, Infomaniak has the ideal hosting package for you. The vendor has an all-in-one web hosting plan that incorporates email hosting. The plan includes extendable 100GB SSD disk space, unlimited MySQL databases, 25+ email addresses, 20GB+ of VOD/AOD, and 20+ domains. The web hosting package also comes with LetsEncrypt EV and DV SSL certificates powered by Comodo/Sectigo. For very large websites with high traffic volume, Infomaniak recommends its dedicated servers solution based on its cloud servers. In addition, Infomaniak stores backups on different servers in different data centers. The backups are performed daily and users can access them via FTP. Apart from web hosting solutions, this hosting provider offers CMS like WordPress, Joomla, and Drupal. Through this solution, clients can easily create a forum or an e-commerce website. It offers over 120 scripts with one-click installation. As hinted above, this hosting vendor allows you to create your own hosting package, therefore, prices change based on the features you choose and the resource restrictions you include. However, the vendor also has competitively priced, pre-designed hosting packages. Infomaniak offers service satisfaction and promises that if you are not happy with the offer, your money will be refunded, thanks to the 30-day money-back guarantee. The company has a guaranteed uptime of 99.9%. The Infomaniak customer support is available via telephone, email, live chat, or ticketing system. It is listed as available 24/7 but is quite slow to respond. The support team responded to the ticket I opened almost 72 hours from the time I sent it. All the same, when they finally did, their response was quite detailed and adequately addressed the issues that I had raised. Indeed, the support team appears quite knowledgeable in hosting-related issues. Additionally, the vendor has made available a comprehensive knowledge base; it has answered over 1,000 questions and has over 500 tutorials and explanatory videos. Infomaniak is an environmentally conscious hosting provider with feature-packed web hosting solutions designed to handle most SMEs. The vendor does not offer VPS and dedicated server solutions, meaning businesses that need these solutions would have to search elsewhere. Wondering how Infomaniak stacks up against other Web Hosting companies? Enter any other Web Hosting company and we will give you a side-by-side comparison.